A number of games were talked about during this morning’s Japanese Nintendo Direct, including the announcement of the final Professor Layton game (though maybe just the final game of the second trilogy, depending on certain factors). But one of the talked about games that has the internet buzzing is the downloadable rhythm action game from Game Freak (the developers behind Pokemon), HarmoKnight. In HarmoKnight, you play as Tempo, an apprentice to the warrior Master Woodwin, as you and your bunny friend Tappy deliver the Legendary Wand to the Kingdom of Symphonia. The wand, which can only be used by a HarmoKnight, is to be used as a weapon to save Harmonia (I’m guessing that’s the name of the planet; my Japanese is non-existent) from the evil Noizido and their noise. 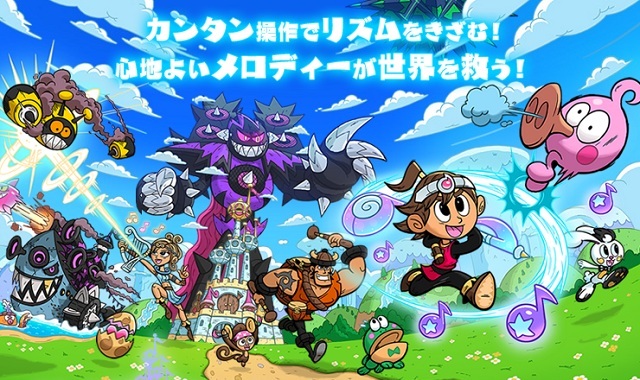 Along the way, you will also play as Laila – a warrior of Harmonia who uses a harp as a bow and arrow – and the duo of Jinbei and Symbi – the latter being a monkey, the two work together to defeat enemies. HarmoKnight, which started its development a year and a half ago, was the idea of British Game Freak employee James Turner, who is the 3D Graphic artist and designer of Vanilux-line and Vullaby, and is produced by Pokemon game director Junichi Masuda. The game already has a demo out for Japanese 3DS owners. So far, the most talked about part of the game seems to be that it looks and feels like a fleshed out Bit. Trip Runner, which they all agree is a good thing. Here’s hoping we hear about a western release soon. HarmoKnight will be available for download on Japanese 3DS systems on September 5th for 1800 Yen (roughly $23 USD). To check out the HarmoKnight website (WARNING: an understanding of Japanese may be needed), click here.